As I was listening to this album it hit me hard that this is the album I've been missing. The logical next step in recent Southern albums that are more or less overtly political- from Southern Rock Opera to Lee Bains III & The Glory Fires' Dereconstructed to now, American Band. It never resonated with me to listen to some person from the North (or Midwest or West) to talk about these issues, because they weren't/aren't from here- they don't grasp the subtleties. To hear it from Southern voices, that talk the way I grew up talking, that use the same cadence and same odd slang I use, that's something entirely different. And, to be clear, I don't think you HAVE to be a Democrat or Republican, conservative or liberal, to fully appreciate the political air of this album and what it means for Southerners (and the country) right now. Drive-By Truckers have always been somewhat political. Whether or not they were overt was dependent upon the song, but you can't get more political than past songs "The Righteous Path," "Uncle Frank," "Puttin People On The Moon," or "Wallace." They may not be set in the current time period, but they are political powerhouses nonetheless. Interestingly, it's always seemed that Patterson Hood was the one who was willing to delve a bit more into the political side of songwriting, until American Band. (Which, can I just say as a side note is a perfect name for this album. A political album by a band from the South called American Band. No other regional distinction necessary.) Now we have Mike Cooley really diving deep into the same waters and we are much, much better for it. I've always been more of a Patterson Hood fan when it comes to songwriting- I like his storytelling and fierceness. Don't get me wrong, I've always loved Cooley as well, but Hood has always hit a little closer to home for me. However, on American Band, Cooley has the knock-out punches to me with "Ramon Casiano," "Once They Banned Imagine," "Surrender Under Protest," and "Filthy and Fried." I mean, when Cooley sings "to half-cocked excuses for bullet abuses regarding anything browner than tan," on "Once They Banned Imagine," it's heavy. That line got me like a punch in the gut. The other Cooley songs on the album are wonderful takedowns of the good ol' boy South. Whatever, or whoever, got us thinking we are too macho, or stubborn, to accept any sort of change has been detrimental to ourselves- and more importantly, those who chose to leave- in so many ways. The South has been dealing with "brain-drain" for years and I can tell you firsthand, some of us want to go back to a better South, not the same old South. Back to the album though! For Hood, his two songs "Guns of Umpqua" and "What It Means" stand to be two of my favorite Hood songs of all time. "Guns of Umpqua" paints an incredibly eerie and horrible picture of someone on the verge of getting gunned down in the community college shooting. "What It Means" questions the recent violence on young black men in America and what that means for us as a nation. These are supremely touching songs and I can't imagine the DBT catalog without them already. At the albums core, American Band is all about dealing with the current state of the American way of life. Where do we go from here? How do we process the last couple of years of utter outrage and fear? At what point do we start the healing process? I think it can begin at any moment we want it to, but we have to start asking ourselves the tough questions, and that can begin with those of us in, or from, the South. Southerners are strong people, mentally and physically. I miss the South I grew up in where hatred sure didn't seem so prevalent (although I'm sure it was there). 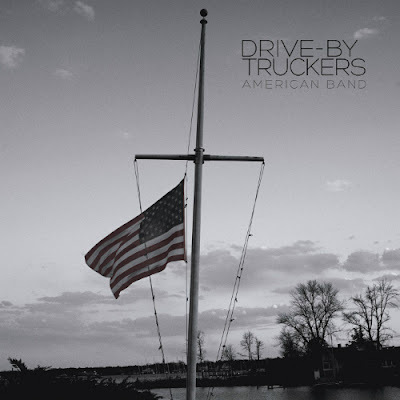 American Band is a good starting point, so go listen and listen with friends and family. Ask yourselves what it means. Now, let's see where we can go from here and let's be better. American Band is available today on all modes of ingesting music. A transparent, ham-fisted temper tantrum that dutifully checks all the boxes. It'll be a huge hit with children whose favorite news anchor was Jon Stewart, and want free college...and who rail against capitalism by tweeting on an iPhone. Cooley and Hood jumped the shark.